Not only was Megalodon the biggest prehistoric shark that ever lived; it was the largest marine predator in the history of the planet, vastly outweighing both the modern Great White Shark and ancient reptiles like Liopleurodon and Kronosaurus. 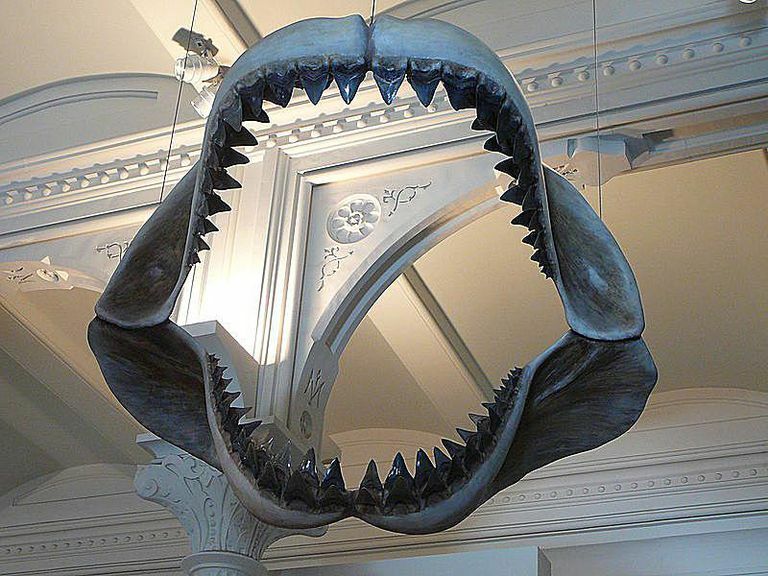 Below you'll find 10 fascinating facts about Megalodon. Since Megalodon is known by thousands of fossilized teeth but only a few scattered bones, its exact size has been a matter of contentious debate. Over the past century, paleontologists have come up with estimates, based mainly on tooth size and analogy with modern Great White Sharks, ranging from 40 to 100 feet from head to tail, but the consensus today is that adults were 55 to 60 feet long and weighed as much as 50 to 75 tons--and some superannuated individuals may have been even bigger. Megalodon had a diet befitting an apex predator, feasting on the prehistoric whales that swam the earth's oceans during the Pliocene and Miocene epochs, but also chowing down on dolphins, squids, fish, and even giant turtles (whose equally giant shells, as tough as they were, couldn't hold up against 10 tons of biting force; see the next slide). Megalodon may even have crossed paths with the giant prehistoric whale Leviathan! In 2008, a joint research team from Australia and the U.S. used computer simulations to calculate Megalodon's biting power. The results can only be described as terrifying: whereas a modern Great White Shark clamps its jaws shut with about 1.8 tons of force per square inch, Megalodon chomped down on its prey with a force of between 10.8 and 18.2 tons—enough to crush the skull of a prehistoric whale as easily as a grape, and far outclassing the bite force generated by Tyrannosaurus Rex. Megalodon didn't earn its name "giant tooth" for nothing. The teeth of this prehistoric shark were serrated, heart-shaped, and over half a foot long; by comparison, the largest teeth of a Great White Shark only measure about three inches long. You have to go back 65 million years--to none other, once again, than Tyrannosaurus Rex—to find a creature that possessed bigger choppers, though the protruding canines of some saber-toothed cats were also in the same ballpark. According to at least one computer simulation, Megalodon's hunting style differed from that of modern Great White Sharks. Whereas Great Whites dive straight toward their prey's soft tissues (say, a carelessly exposed underbelly or the legs of a wading swimmer), Megalodon's teeth were especially suited to biting through tough cartilage, and there's some evidence that this giant shark may have first sheared off its victim's fins (rendering it unable to swim away) before lunging in for the final kill. Technically, Megalodon is known as Carcharodon megalodon--meaning it's a species (Megalodon) of a larger shark genus (Carcharodon). Also technically, the modern Great White Shark is known as Carcharodon carcharias, meaning it belongs to the same genus as Megalodon. However, not all paleontologists agree with this classification, claiming that Megalodon and the Great White arrived at their striking similarities via the process of convergent evolution. The ocean's natural buoyancy allows "apex predators" to grow to massive sizes, but none were more massive than Megalodon. Some of the giant marine reptiles of the Mesozoic Era, like Liopleurodon and Kronosaurus, weighed 30 or 40 tons, max, and a modern Great White Shark can only aspire to a relatively puny three tons. The only marine animal that outclasses the 50- to 75-ton Megalodon is the plankton-eating Blue Whale, individuals of which have been known to weigh well over 100 tons. Megalodon's Teeth Were Once Known As "Tongue Stones"
Because sharks are constantly shedding their teeth—thousands and thousands of discarded choppers over the course of a lifetime—and because Megalodon had a global distribution (see next slide), Megalodon teeth have been discovered all over the world, from antiquity to modern times. It was only in the 17th century that a European court physician named Nicholas Steno identified peasants' prized "tongue stones" as shark teeth; for this reason, some historians describe Steno as the world's first paleontologist. Unlike some sharks and marine reptiles of the Mesozoic and Cenozoic Eras—which were restricted to the coastlines or inland rivers and lakes of certain continents—Megalodon enjoyed a truly global distribution, terrorizing whales in warm-water oceans all over the world. Apparently, the only thing keeping adult Megalodons from venturing too far toward solid land was their enormous size, which would have ​beached them as helplessly as 16th-century Spanish galleons. So Megalodon was huge, relentless, and the apex predator of the Pliocene and Miocene epochs. What went wrong? Well, this giant shark may have been doomed by global cooling (which culminated in the last Ice Age), or by the gradual disappearance of the giant whales that constituted the bulk of its diet. By the way, some people believe Megalodons still lurk in the ocean's depths, as popularized in the Discovery Channel show Megalodon: The Monster Shark Lives, but there's absolutely no reputable evidence to support this theory.